Although they may be called by different brand names, all flat-top cook stoves are made of a glass-ceramic blend rather than being all-ceramic or all-glass. Each appliance company has a trademarked name for its brand of glass-ceramic. A ceramic-glass blend cooktop is between 50 percent and 95 percent crystalline. Smooth cooktops have some qualities of ceramics and some qualities of glass. The tops are formed first as glass, then treated with a heat application that causes it to partially crystallize. This gives the cooktop the expansion capabilities of a ceramic without the porous nature of a true ceramic. The glass-ceramic cooktop is an extremely strong material that handles extreme temperature changes without breaking. However, it can break if you drop a hard object on it, and can scratch, especially when a granular object catches under a sliding pan on a stovetop. 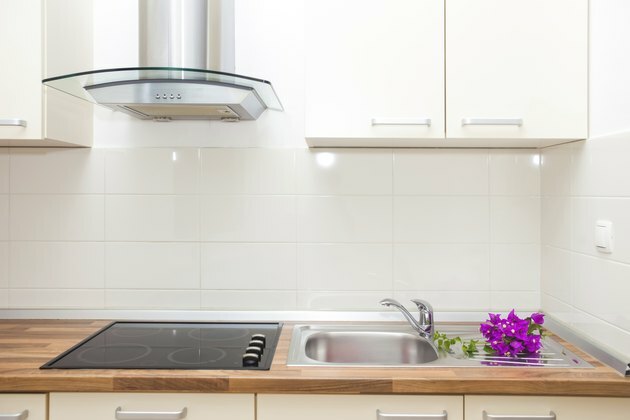 Glass-ceramic stovetops are easy to clean since they have a flat surface. However, most respond best to cleaners manufactured specifically for a smooth-top stove. Spills clean up best when you wipe them up immediately after they occur. For dried-on spills, a glass scraper effectively cleans the surface of the stovetop.